Notes: This arrangement features buttons with expressions against state repression, racism and its violence, and support to free individuals viewed as political prisoners. 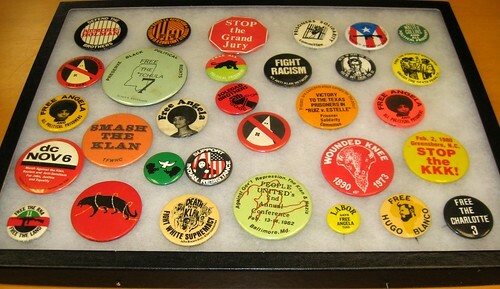 Solidarity with prisoners’ struggles is a common theme evidenced by buttons supporting Ruiz vs. Estelle, the Pontiac Brothers, Soledad Brothers, The Charlotte Three, the Atmore-Holman brothers, and Walter Collins. Additionally, there are numerous anti-Klan sentiments expressed, some by specific organizations like the John Brown Anti-Klan Committee and N.Y. Anti-Klan Network. Some of the celebrated political prisoners are of different countries, like Peru and Puerto Rico.